StarLite I am sorry I missed your birthday. Many Happy Returns StarLite !! Banana coconut cake does sound pretty good. Sadly my living residence is currently cake'less. Oh Hats, that cake is ambrosia. That icing isn't very sweet either. I always end up scraping the icing off most cakes but not that one,actually, I think it's whipped cream frosting. Hubby's birthday is coming up soon, I'm going to see if I can talk him into one of those cakes. When I used to make cakes I used to use pudding and whipped cream for frosting. When you make the pudding instead of 2 cups of milk you use one and a cup of whipped cream. I used to use Dream Whip so a package of that made by the box instructions. Once you mix both pudding and cream put them in the fridge to cool before mixing them together so they'll be stiff. I used to make fudge marble cake with caramel, butterscotch or butter pecan pudding. Hubby has decided he wants a Gingerbread made for his birthday if I'm up to it, or I'll be up to it alright. I have some molasses I don't want to go bad so I want to use it up. How is your loved one doing, I hope they are feeling better. I'm not much for desserts, but that cake looks pretty good. 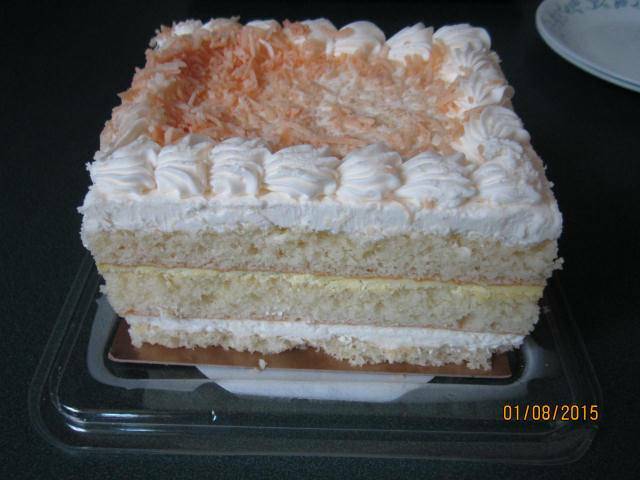 I'm not supposed to be eating sweets but that cake is irresistible and well worth the weight gain. Actually hubby's birthday is coming up and they make a strawberry shortcake (his fav) in that brand of cake, so we get to do it all over again. YUM!